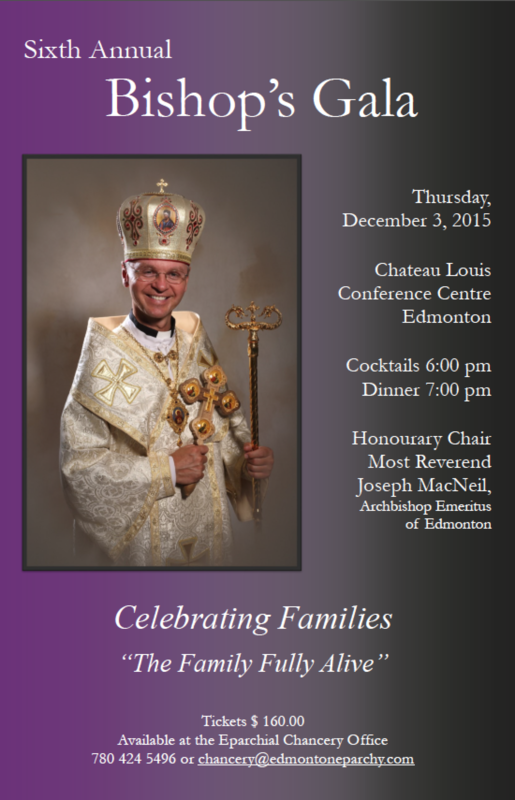 Six Annual Bishop’s Gala, Thursday, December 3, 2015 at the Chateau Louis Hotel and Conference Centre. This festive gala raises funds to support the operation and programming of the Ukrainian Catholic Eparchy of Edmonton. The evening will begin with a cocktail reception at 6:00 pm, followed by dinner and an exciting live auction. A silent auction will be held throughout the evening. Tickets are $160 each or $1280 per table of eight. A charitable tax receipt for $75 will be issued per ticket. Due to the tremendous success of Galas past, you are encouraged to purchase your tickets as soon as possible. Contact the Chancery Office to purchase tickets: 780 424 5496 or chancery@edmontoneparchy.com. Also accepting donations of silent and live auction items from individual and corporate sponsors. Contact Andrea Leader at 780 424 5496 or admin@edmontoneparchy.com to make a donation. All proceeds of the Gala will support the mission of the Church, that is, the sharing of the Good News of the Gospel of Jesus Christ.